At a presbytery-wide worship service (In the Presbyterian Church U.S.A. denomination, churches are geographically grouped into presbyteries), the theme of worship was around the concept of love. The Rabbi Judy Shanks from Temple Isaiah in Lafayette, CA, was the guest preacher. She preached a beautiful sermon that wove in verses from the song, Seasons of Love from the musical Rent. How will you measure, measure your year? 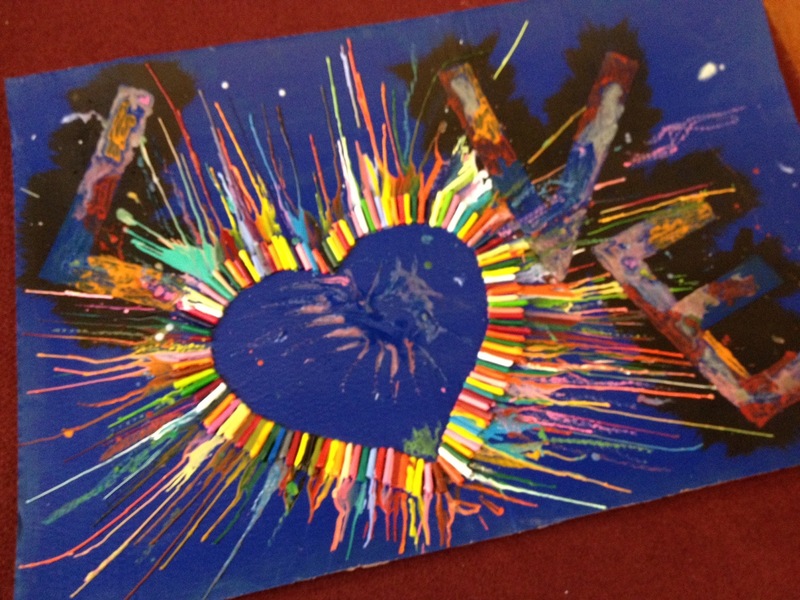 After the sermon, people were invited to quietly reflect on the question of how God calls us to measure our life in love? Instead of having them light a candle in prayer, I invited them to mark their prayer in a different way. In preparation for worship, I first made a board to mark their prayers. I painted the cardboard a dark color like blue or black. 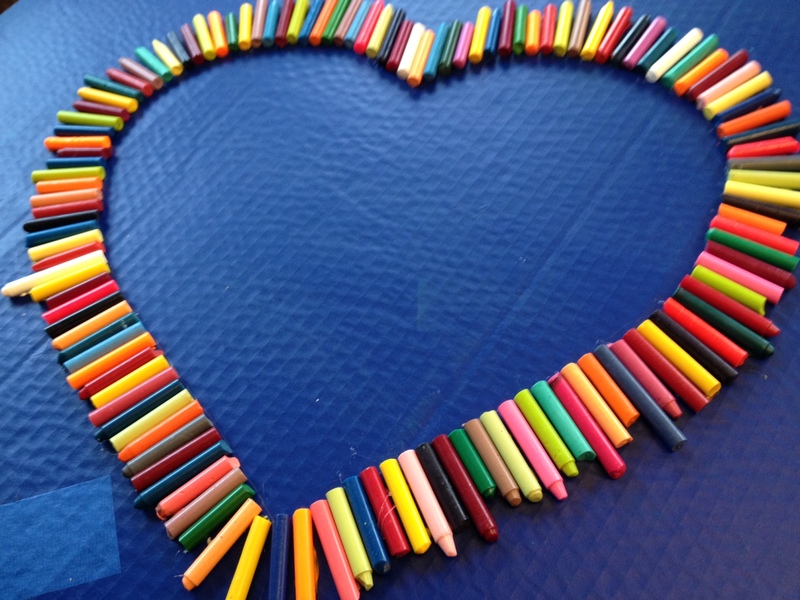 I then glued the crayons in the shape of a heart. 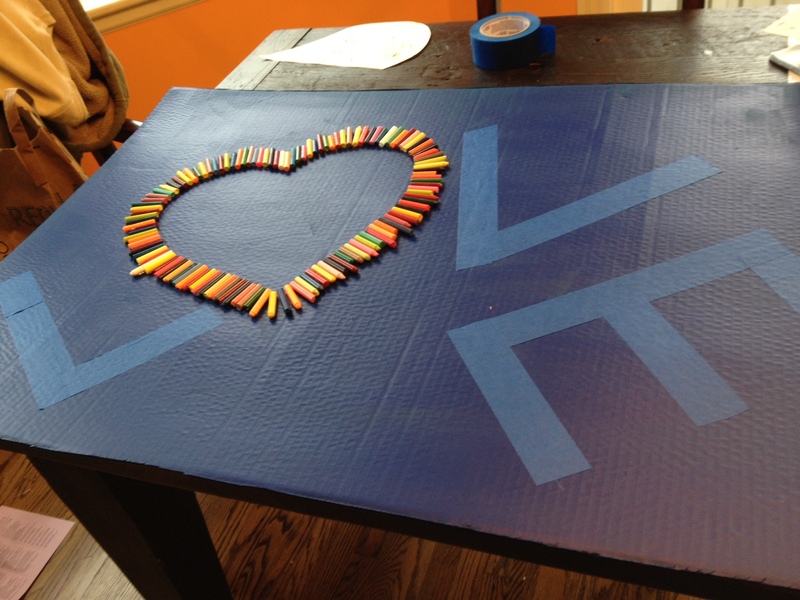 I taped off the letters L, V, E using blue tape to spell the word LOVE. 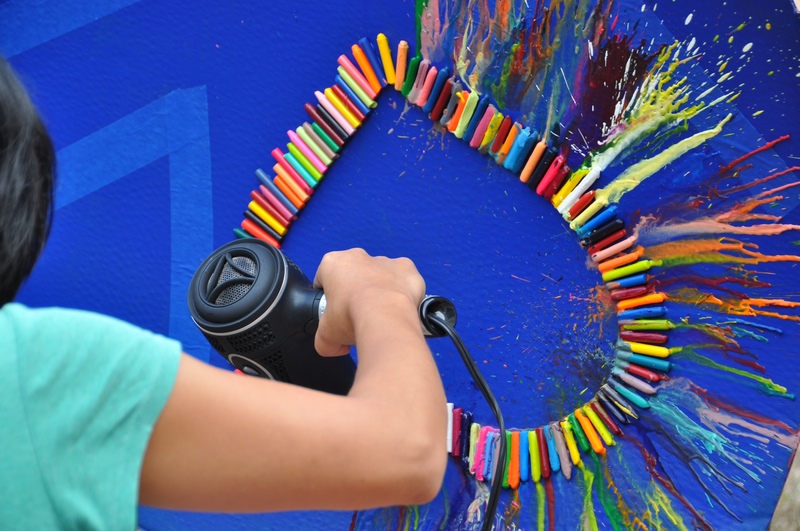 You can use a hair dryer to melt the crayons so that they melt over the taped off letters. You can see the video on how to do this here. The hair dryer can get messy and take a while for the crayons to melt. I find that using a heating tool for embossing works much better. I rotate the board so that the crayons melt in different directions. I then used some blue paint to accent and outline the letters so that they stand out better. 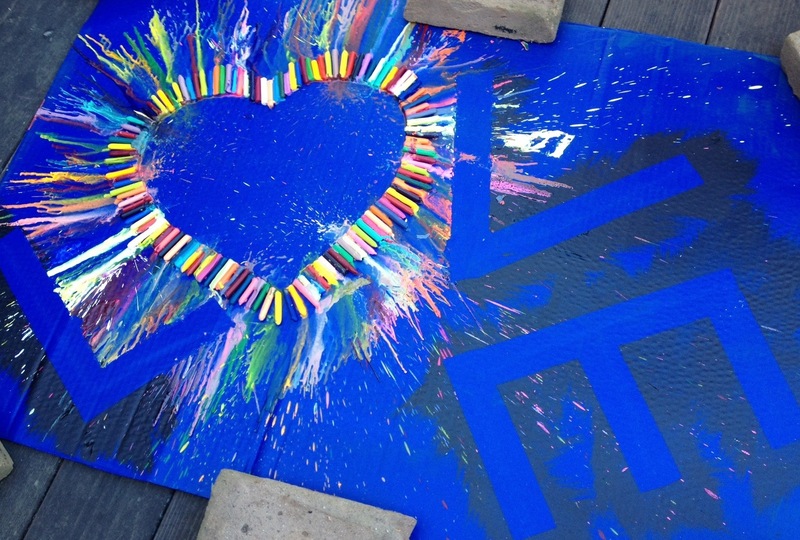 Then, carefully peeled off the blue tape, making sure not to chip or crack any of the melted crayon. 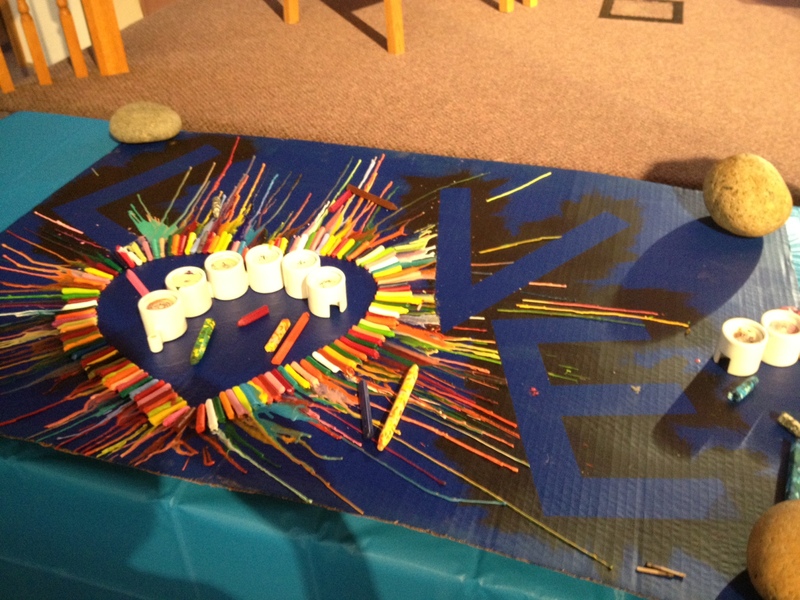 Using the board, I decorated the table for worship. I put out tea light candles and crayons. Try and get crayons that are designed for toddlers. The fat crayons melt better. very cool! We do a prayer station installation for advent, and I’m thinking some version of this would be great. I’m not sure what you mean by a ‘heated tool for embossing.’ Is this a question that I could ask at my local craft store and receive direction? Also, I like to leave the prayer station installation up during the week, and we have a lot of concerns about open flames (fire marshalls, the presence of potentially flammable fabric elsewhere in the installation, etc.) Might this ‘heated embossing tool’ be plugged in by the pray-er and used to melt the crayon within a reasonable amount of time and with safety and simplicity? Hey Karen, a heating tool for embossing can be found at any craft store like Michael’s. It looks like a long tube that puts out stronger heat than a hair dryer. If you ask for it at a craft store, they should know what you are talking about. Sometimes, it is found near the stamps and embossing powder. I can see how open flame could be a concern. An alternative could be they could use the crayon to draw or mark the board and then use the heating tool over their drawing to melt it. That way they don’t burn themselves trying to melt the crayon first. Does that make sense? What happens to these creations after you’re finished? Some people struggle with the notion of ephemeral art. Some gets reused and refashioned. Some gets thrown away. Sometimes it gets taken home.